The American Association of Orthodontists recommends that all children get a check-up with an orthodontist no later than age seven. Although only a few orthodontic problems need to be corrected at that age, an early exam allows the orthodontist to offer advice and guidance as to when the appropriate age to start treatment would be. Let your orthodontist guide you as to when to start treatment. Feel free to ask questions about the timing of treatment. Teeth respond to the gentle forces that are applied to them. 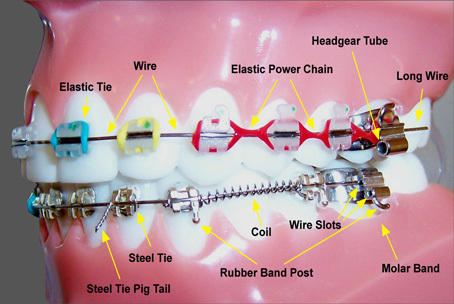 “Braces” are a combination of “brackets” and “wires”. Brackets are the part of the braces that attach to the teeth. Brackets are the “handles” that help control movement of the teeth. Braces require a wire called an “archwire” that connects the brackets and provides the forces to steer the teeth in the proper direction. It’s actually the wires that move teeth. The interaction of brackets and archwires enables the orthodontist to have three-dimensional control over the movement of the teeth. 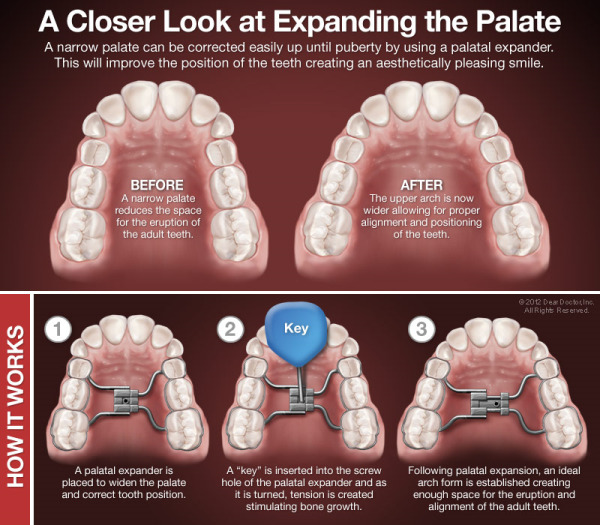 In many cases, additional forces are needed to help balance the underlying jaw structure and to help the upper and lower teeth fit properly together to make the bite right. Examples of these extra forces include: elastics (rubber bands) hooked to teeth (see photo below); functional appliances; and palatal expanders (see photo below).